By washing 3 sides of a vehicle simultaneously, the xp™ cuts down on wasted movement and increases throughput. It is the second fastest touchless in the industry, second only to the oasis typhoon™. Onboard side blasters, bumper blasters, multiple chemical wands, zero degree nozzles and underbody wash work together to produce cleaner vehicles at minimal costs. The xp™'s computer controls give you the versatility to wash the smallest cars to the longest pickups, even duallys, as well as the ability to select the wash cycles just right for each location. Its unique winterization system allows it to run in the coldest climates. 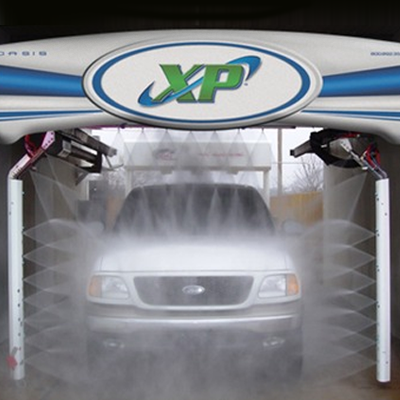 The xp™ program is designed to safely wash vehicles. With the 360° breakaway wands, vehicle strike damage is eliminated. There are no shear pins, and the system is easily reset by the operator. Hydraulically powered, the xp™'s drive system is so reliable we offer a 5 year warranty, a feature unmatched in the industry. Oasis' onboard xpert™ monitors the entire system as well as the customer, and keeps you informed of unusual events. Another xp™ feature is the industry-exclusive vehicle avoidance system (vas™). If xp™ comes in contact with any portion of the vehicle such as extended mirrors, trailer hitches, snowplows or any other after-market add on, vas™ will make necessary length and width adjustments and continue the wash cycle. The xp™'s stainless steel, wall-mounted frame helps protect the unit from damage by water, chemicals and grime through its elevated carriage system. Also constructed of stainless steel, the xp™ pumping plant is fully enclosed to reduce noise, and its flexible design allows for an integrated air compressor to save on space.